December 1989. The end of a decade; the end of an era. On 23rd November, Sir Anthony Meyer challenged Margaret Thatcher for the leadership of the Conservative Party, taking another step towards Tory matricide. On 3rd December, in the aftermath of the Berlin Wall’s fall, Thatcher, George Bush and Mikhail Gorbachev declared that the Cold War was over. And on 6th December 1989, at 7:59pm, Doctor Who ended. It wasn’t a spectacular death. There were no announcements, no grand finale like Blake’s 7’s final massacre. We never saw the body. Even in 2013, it’s hard to watch Survival without being acutely aware that, until 2005, for most people this was the last-ever story. Of the five million that tuned in to Part Three, only a tiny fraction, maybe one per cent, followed Doctor Who through the long 1990s. Twice as many tuned in for the TV movie in 1996, but the McGann film doesn’t have the same melancholy overtones as Survival – it was a false start, rather than an ending. The thing is, unlike Logopolis, these overtones only exist in the heads of fans. Or maybe only in the head of this fan. Survival wasn’t even written as the last story of Season 26, and certainly not as the last-ever Doctor Who. Apart from the tacked-on monologue that was recorded months after the rest of the story, there’s nothing here that eulogises Doctor Who, or does things that only a final episode can do. Rona Munro just gets on and tells the story she wants to tell, blissfully unaware that it’s the last story this show will ever tell. And what a story. Over the McCoy era, I think there is a general upwards trend in quality. 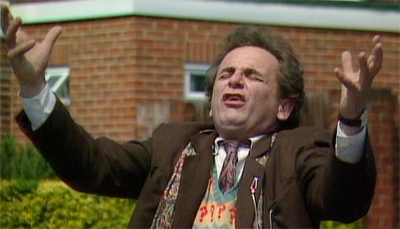 Time and the Rani is by far the worst seventh Doctor episode, but even that’s on an upward trajectory from the show’s lowest point in 1986. Season 25 is a marked improvement, and Season 26 is one of the strongest ever. The Curse of Fenric is a fantastic synthesis of everything that’s great about Hinchcliffe Gothic, mixed with a healthy dose of Cartmellian social politics. Then we get to Survival. The first thing to note about this is the one everyone since 2005 has noticed: this is the first ever Doctor Who story that takes place in suburbia, in the living rooms and the front gardens of London. The TARDIS lands at the end of a nondescript street, the Doctor hunts alien predators across the pavements and behind the privet hedges as curtains twitch and the Neighbourhood Watch worries. The Master invades a council flat. The Doctor goes shopping at the local supermarket. This goes beyond Yetis in the Underground and Autons on the High Street: Doctor Who has invaded the sitting rooms of Zone 4, taken over the kids’ adventure playground. The first new series story they made, Aliens of London, has a companion returning home for the first time to discover she’s a missing person, it has a monster invading a council flat and sly digs at the current government. There is a direct, unbroken link between Survival and the 2005 series, over and above any of the innovations that are going to come from the New Adventures or the Big Finish audios. It would be perfectly feasible to jump from this to Rose and ignore everything that came in between – which is exactly what most people did. The fact that John Nathan-Turner, Alan Wareing, Andrew Cartmel and Rona Munro got in an Eccleston story 16 years early is utterly remarkable. Because this feels more like an Eccleston story than anything else: it’s angry, edgy. Rona Munro wanted to attack the savage, tribal politics of the 1980s – the politics that generated statements like “greed is good” and “there’s no such thing as society”. Paterson talks about “survival of the fittest” and “self defence” (with the emphasis very much on the self). He talks about kids having to “fight or go under” as though they’re small businesses. Hale and Pace make the same points in their little shop, and McCoy, apparently improvising the Doctor’s response, comes up with one of the best lines of the story – even if you manage to out-run your friend, saving your own skin while the chasing lion eats them, “What happens when the next lion comes along?” The first episode sets up all these ideas, and is crammed with beautiful details like the hunt saboteurs tin that Ange rattles at Ace, the run-down youth club suggesting the Tory government’s abandonment of the young. Then the second episode, predominantly set on the Cheetah Planet, shows the consequences of a society of dog eat dog (or whatever). The Master makes the point that the planet has been torn apart by the savagery of its inhabitants, and it’s infectious – not even a Time Lord can fight against a society that’s institutionalised violence. The quarry used the previous year to record The Greatest Show in the Galaxy is suitably alien, by all accounts baking hot. It looks hostile, and like a believable environment, with valleys, lakes, wooded areas and ruins. There’s a sense of scale you don’t often get in classic Doctor Who. In Ace’s case, this not only provides a moral to the story, but also is an important moment for her character. Season 26 is largely a story about Ace growing up and overcoming her demons including her relationship with her mother and memories of the racist attack that’s haunted her for years. Going from a delinquent who brews home-made explosives to a young woman who recognises that most important problems can’t be solved by blowing them up, the Ace of Survival isn’t a kid any more. One of the great missed opportunities of the New Adventures and the Big Finish audios is that they generally fixate on the Ace of Battlefield and not the Ace of Survival. The character development of Ace and the performance of Sophie Aldred are two of the great joys of the McCoy years, and another precursor to the 2005 series and Rose’s growth from shop assistant to Bad Wolf, Martha’s journey from student to revolutionary and Donna’s from squawking harpy to the most important woman in the universe. The use of the Master is interesting: he seems more of a distraction to the Doctor than a real threat to be dealt with. “Survival is what he lives for” says the Doctor at one point. Given the Master’s downward trajectory from galactic master criminal, to decrepit psychopath clinging to life, to a villain openly mocked by the Rani and playing second fiddle to the Valeyard, the last few years haven’t been auspicious. Survival doesn’t exactly restore dignity to the character – quite hard when he’s transforming into a feral beast – but Munro does pick up on the Ainley Master’s occasional savagery, and uses that to make him nastier than he’s been at any point since Castrovalva. His degeneration was, famously, meant to have contrasted with the Doctor’s evolution to something more than just a Time Lord. Probably wisely, these sequences were cut, although it slightly robs the final confrontation between the two of the yin and yang element – something that the McGann movie actually improves on, by having a dying and decaying Master contrast with a young and strong new Doctor. Above all, the most important thing about Survival is that it’s very, very good indeed. It’s not quite like the rest of the Sylvester McCoy years – there’s no great threat from the Doctor or Ace’s past rising up to menace them; no final showdown with ancient gods. All the scenes that would have furthered the “Cartmel Masterplan” were excised before recording. But where it is very much a McCoy story is in the mix of the epic and mundane. It suggests that what goes on in an ordinary street in Perivale is every bit as important as exploding planets, that these ordinary people with their cats and their cars and their youth clubs are worth fighting for. Doctor Who started off as the story of two very ordinary teachers who, through concern for a child, were dragged from present-day London into a universe of danger and monsters and life and death. Somewhere along the line, in 26 years full of Time Lords and Guardians, Emperors and Intelligences, revolutions on alien worlds and the heat death of the universe, something was lost. Survival begins with ordinary people being kidnapped from present-day London and taken to a baking, bone-strewn desert and a forest of fear. The lessons here, that fear makes companions of us all; that violence is ultimately self-destructive; that no matter how different we might look, humanity is constant, and that no one individual, no matter how fast or fit or self-reliant, is stronger than the whole tribe, are the very first lessons we learned all those years ago. In its way, Survival is as magical and revolutionary as An Unearthly Child. If this is an ending, then it’s the best ending we could have wished for. But it’s not. It’s a new beginning. On 6th December 1989, in a council flat in Perivale, the Doctor and Ace comfort a little girl. A few miles away, in another council flat, a widow sits on her daughter’s bed and tells her own little girl a story. Rose Tyler – the Doctor is coming to get you. Next Time: “Then suddenly, one year, there was no spring.” 1990.